Learning how to make a swamp bed is a very valuable skill. Not only can it keep you dry, it can also make your camping experience more enjoyable. But you should only cut the required material as needed and always check park regulations before cutting any plant material. To begin the process, one will need to take a survey of your available material. You will need four trees that are close together and in an arrangement that forms a rectangle. If you are not lucky enough to find this, do not worry. It is easy to create this by cutting tall bamboo and pushing this bamboo into the ground until it is secure. Next, cut two more poles that are the length of the rectangle and secure these poles to the bamboo poles in the ground using a strong knot of your choice. Once that is done, it is time to create the bed “springs.” The ‘springs of this bed consist of branches cut into the length of the short end. Add these cut branches to the top of the bed and secure. After that is done, top the “springs” with green grass and/or large leaves. Now the bed is done but what else can you do to make it feel like home? Well, you can add a heat source to your bed but be careful. If the material is dry, using this approach can cause your bed to catch on fire. But, if you want a little heat create a fire pad in one corner. To do this, simply pack mud, clay and/or silt into one corner underneath the bed. Allow the earth to dry and harden completely. This simple hearth will create a dry surface by which you can start a fire. 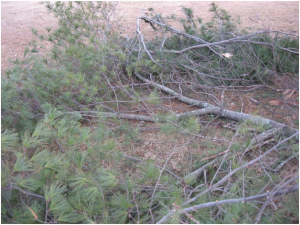 After the fire pad has dried, build a fire starting with kindling and then work up to large branches. You can enjoy the fire underneath the bed, which is especially helpful if it is raining or on top of the bed. While every camper feels they are prepared for the worst, it is a good idea to learn survival skills that can keep you dry and warm during any emergency or primitive camping trip. Please keep in mind that any time a natural camp is made, it will need to be dismantled to abide by the concept of Leave No Trace even though it was made with natural materials.